Can China’s endangered tigers adapt to new homeland after overseas ‘rewilding'? A controversial African "rewilding" project, engineered to save the South China wild tiger from certain extinction, may finally be about to bare its teeth. Three tigers, sent to the African wilderness, are finally expected to return home after a decade, along with their 15 surviving offspring. "As early as the end of this year," Fu Wenyuan, director of the Meihuashan South China Tiger Breeding and Research Center in Longyan, Fujian Province, told the Guangzhou Daily about the tigers' planned timetable. It was about 10 years ago that China's State Forestry Administration (SFA) agreed to a proposal to raise cubs in South Africa's Laohu ("Tiger") Valley Reserve, where it was hoped that wild tigers could not only be protected but "rewilded" - reared for release back into their natural habitat. There are only a mere around 100 panthera tigris, tigers indigenous to China; none are wild. "The initial procedures for exporting these highly endangered tigers were illicit," Fu Dezhi, a researcher from Institute of Botany, Chinese Academy of Sciences, told the Global Times, adding: "There are still lots of barriers for retrieving them." According to the Convention on Internaitional Trade in Endangered Species of Wild Fauna and Flora, the export of South China tigers requires the prior permit of China's Endangered Species Scientific Commission. However, according to a report by the Xinhua News Agency, the Commission revealed that no advice on the relocation of the five tigers to South Africa had been sought, or given by them, in relation to the Laohu project. Back in 2000 Beijing-born conservationist Quan Li and husband Stuart Bray, an American financier, established the Save China's Tigers charity in the UK. Later registered also in the US and Hong Kong, and with Jackie Chan as "ambassador," the foundation reached an agreement in 2002 with China's Wildlife Research and Development Center (WRDC), an SFA affiliate, to aid the breeding and rewilding of South China tigers in Laohu, a 33,000-hectare rolling reserve set in South Africa's Karoo region. 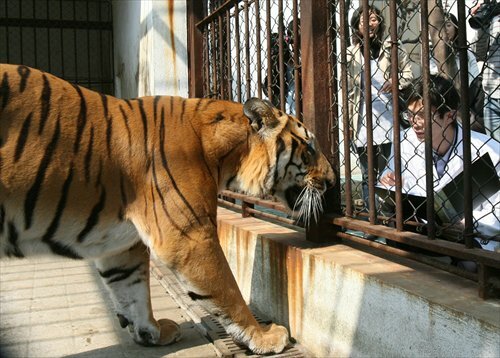 Since 2003, a total of five captive tigers embarked on an overseas life in Laohu. There were setbacks: One - named, somewhat unfortunately, Hope - died of heart failure in 2005 and another, zoo-raised male brought in for breeding, called "327," was slaughtered by another tiger following an accidental introduction. But the agreement was that the tigers would be reintroduced to China's wilds in 2008, with WRDC receiving an annual interim leasing fee of $100,000, according to China Youth Daily. That 2008 deadline may have been ambitious. To complicate matters, Quan and Bray became embroiled in a bitter divorce over alleged assets worth £50 million that saw allegations of embezzlement aired in court. At a December 2013 hearing in the High Court in London, Quan claimed the charity had helped fund the couple's personal expenditure. "We were using the money to fund our personal things," the Daily Mail quoted Quan. "We had expensive dinners. We had expensive wine." Quan's lawyers told the court that Bray had created a "back door" to funnel cash from the Chinese Tigers South African Trust, set up by the original Save China's Tigers charity in 2002 for operating the Laohu project. Although Bray denied using this cash for his own means, the case drew worldwide uproar, especially from China. Fu Dezhi now suspects the whole affair may have been a scam: "It's likely that China will have to resort to legal means to bring back the tigers," he noted. Although, as recently as 1949, statistics claimed up to 4,000 in the wild, not a single verified South China tiger has been seen in the wild in decades. There are 18 South China tigers living wild in the Laohu Valley with names such as Tiger Woods, Cathay and Madonna. And, although forestry officials admit their inadequacy in preparing a natural habitat for the returning tigers, Laohu's "tiger supervisor" Vivienne McKenzie, said that nine are already capable hunters, according to Caixin magazine. University of Pretoria post-doctorate fellow Maria Fàbregas explains that, though the landscapes differ in two countries, the vast plains of Laohu actually provide less cover than the forest landscape in southern China, making it a more difficult place for hunting. However, Fu Dezhi calls the rewilding project in South Africa a "transnational fraud." Fu's been charting the project's progress since 2003, when Bray reportedly began involvement in forestry in China. The Chengdu Business Daily reported that Senfa Natural Protection Company (China), registered in the Netherlands and controlled by Bray, purchased a 41,000 mu (27.33 square kilometer) mountain from the State-owned Yinwu Forest Farm in Fuliang county, Jiangxi Province in 2006 at a price of 35 million yuan. A Yinwu staff member confirmed the deal's existence, estimating the land is worth at least fivefold that now. This January, Quan Li, who was removed by Bray from their charity in July 2012, told the Beijing Youth Daily that "Everybody is used by my husband - especially the foundation." In a recent telephone interview, Quan declined to comment further on the accusations. "The case is till pending," she stated. "I know there are many negative reports against me. But I'm still trusted by many, who continue to support me with finance and technology." Quan has since set up a new independent charity, China Tiger Revival. Disputes over finances and bureaucracy are far from the only opposition to the Laohu project's dream: scientists and conservationists both home and abroad have warned of certain dangers. Hou Rong, a researcher from the Sichuan Key Laboratory of Conservation Biology on Endangered Wildlife, is one. "The major problem is that the existing South China tigers are extremely inbred and the species suffers from a loss of genetic diversity. Rewilding will amount to nothing unless the in-breeding issue is solved," Hou told the Global Times in a recent interview in Chengdu. All South China tigers are descended from a very few survivors of the 1950s, meaning the population's gene pool must be somehow expanded. Hou's worry was one of a number of concerns posed in a public statement jointly endorsed by several conservation organizations, including the International Union for Conservation of Nature, the World Wildlife Fund(WWF) and the Wildlife and Environment Society of South Africa, in November 2003. It's at considerable expense and risk of failure that bringing tigers, whose natural habitat is the thick forests of Southern China, to African grasslands, a totally different environment with different prey, said the statement. As exotic animals, the tigers would also face - and pose - serious health risks with regard to indigenous animals, it added. Fu Dezhi argues the rewilding project should be conducted in China. 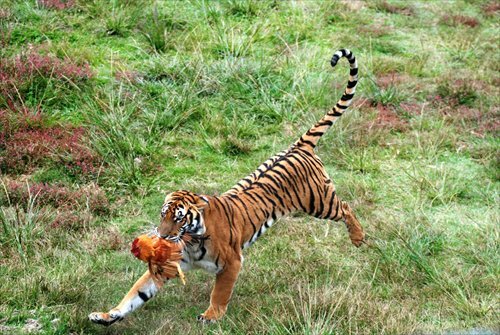 In 1998, the Meihuashan Center, which Fu Wenyuan leads, started its own South China tiger rewilding project. "Why not just fund Meihuashan?" Fu wonders of the Save China's Tigers trust. But Lu Jun, director of the WRDC and a major Chinese representative for the Save China's Tigers project, argued their rewilding project has already proved successful. "It's absurd and unconvincing for those objectors to criticize something they have never experimented with. Their concerns were out of academic projections, not practices," Lu told the Global Times. "Now, several South Asian countries are imitating our rewilding model to restore tiger populations." To ease the inbreeding concern, Lu cited the successful restoration of milu deer and leopard. "From a very small population in captivity, the milu species has now developed to several thousand," he points out. He stressed that the rewilding project will continue but the process of the tigers' return and reintroduction to the wilderness will be long. Fu Wenyuan of the Meihuashan Center says they will provide a transition home for the tigers, which are planned for eventual release to natural reserves in South China. Should rewilding succeed, building fenced reserves and restoring prey to a designated conservation area will be a great challenge, experts warn. Despite its immense size, China's population demands, along with extensive deforestation, means land is an increasingly scarce and valuable resource. The SFA has been unable to come up with a suitably secure reserve to house the rewilded tigers - hence a six-year overshoot of the original deadline. According to consultant Petri Vijoen, the tigers need a habitat of more than 6,000 square kilometers and high density of hoofed animals. This bottleneck - an inadequate habitat, deforestation and degraded environment - presents far more of a problem than the theory behind rewilding, Xie Yan, a researcher from the Institute of Zoology at the Chinese Academy of Sciences, told the Guangzhou Daily. Fan Zhiyong, director of the WWF species program in China, agrees. "It's not easy to reserve a large habitat for the tigers in Southern China with a high population density. Even if the reserves were built, how to ensure they provide enough prey?" Fan told Caixin. And building fences is expensive. Brad Nilson, who advises an investment company under the Chinese Tigers South African Trust, revealed to Caixin that the initial budget for building a tiger reintroduction zone in China was 180 million yuan. According to regulations, project budgets that exceed 30 million yuan require approval from National Development and Reform Commission. Zixi authorities say they need a minimum of 300 million yuan. "The commission didn't pass our budget applications. As far as I know, it's the same situation for the other two reserves," the Wufenghouhe staffer added. Asked to comment on the progress of the domestic rewilding project, an SFA publicity department staffer responded: "Now's not the time."